Construction Equipment and Methods: Planning, Innovation, Safety fosters information literate engineers able to approach complex engineering and managerial problems with confidence and skill. Students of this text will fully appreciate the practical aspects of being a construction engineer and manager, and the dual nature—both technical and managerial—of the responsibilities. The text helps build skills through a cohesive view of construction technology; it’s safe use to maximize productivity and how the principles of science are being applied; linking the material in this course to previous courses (such as statics or geotechnical engineering); and utilizing a pedagogy designed to promote knowledge, and skill acquisition, such as case studies and open-ended problems. Students will be engaged by relevant subject matter, informed by the author’s hands-on research in advanced technologies, mechatronics, robotics, ergonomics and safety. The wide variety of pedagogical tools in the text will appeal to many different learning styles, and provide teachers with more opportunities and resources to get students to reflect about what they are learning; to connect the new to their past experiences; and to understand the relevance of this knowledge to their future. Leonhard Bernold is an Associate Professor of Civil Engineering at North Carolina State University. He is the founder and director of the Construction Automation & Robotics Laboratory (CARL) at NC State in 1991, and The Center for Construction Technology & Integration (CTI). He teaches courses in Construction Engineering and Management and conducts NSF sponsored research related to engineering education. He has published over 70 papers, and in 2006 was honored as a Fulbright Senior Specialist on Education in Engineering. 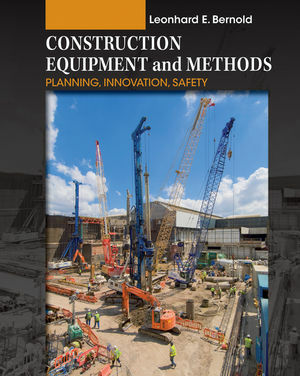 An engaging and cohesive view of construction technology --with a particular focus on safety-- covers ways to maximize productivity and demonstrates how the principles of science are being applied within the field. Designed to advance students’ information literacy skills for life-long learning (and supporting ABET criteria) by offering open-ended exercises, journal writing, and creative problem solving. Provides relevance through case-studies, chapter summaries, open-ended as well as single-answer exercises, and projects requiring application of theory to the field. Chapters are integrated with one or two theme problems based on realistic problems a manager will face, and they are expanded upon in successive chapters of the book. Presents the material with direct and apparent links to other topics that make up the body of knowledge of construction engineering management, including: history in technology, economics, finance, computers, statistics, statics, construction law, and geotechnical engineering. Emphasizes the importance of safety in the construction environment, particularly in Chapter 3: Creating and Deploying Massive Power Safely, and in “From the Accident File” sections throughout.